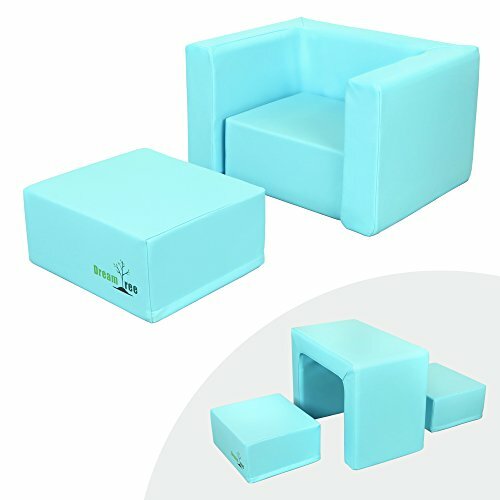 Dream Tree Kids Soft Foam Sofa Desk Set - Chair Type This multipurpose Sofa Desk set is perfect for children ages 4 and under in their rooms, living rooms, day care, and schools. With the sturdy steel centered construction, the desk is strong enough for an adult to stand on, while the chairs are 100% foam for comfortability. Use it as a desk or use it as a sofa, there is no right way to use it; it's all up to the child's imagination! Features: Comfort Foam: Soft premium CPSIA compliant foam Construction Material: Inner steel frame support under soft foam structure Designs Available: Desk sofa set with rounded ear chair, desk sofa set with two stools Upholstery Material: Premium Faux-Leather Product Size (inches): Desk: 19.25"W x 11.5"L x 15"H Stools (x2): 12.5"W x 10.75"L x 5.5"H SAFE AND CLEAN FURNITURE Never have any worries with the Dream Tree Sofa Desk sets! Both the soft foam and the covers are CPSIA compliant and even the zippers are tucked away and covered for safety. In addition, the faux-leather covers are water repellent so all you have to worry about is to wipe away or spot clean with a damp cloth! CARE INSTRUCTIONS Spot clean, air dry. DO NOT use bleach. If you have any questions about this product by Dream Tree, contact us by completing and submitting the form below. If you are looking for a specif part number, please include it with your message.